With an estimated 77 percent of individuals in the UK* requiring a prescription for glasses or contact lenses, making sure workers in industrial environments who are exposed to eye hazards are properly protected is an important issue – yet one that can be all too easily overlooked. Whilst statistically eye injuries may not rank as highly as slip, trip and fall accidents for example, when they do occur they can be catastrophic and life changing for the victim. Not only is prevention absolutely critical, it is achievable. But with a potential lack of knowledge about the varying levels of protection and performance available from prescription (RX) safety lenses – are workers tested on the high street being left open to the risk of under-protection? When it comes to prescription safety eyewear there are a number of key issues that workers and safety managers need to be aware of. 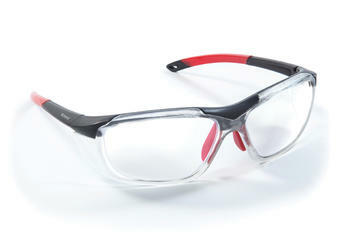 For those operating in industrial settings with a risk of impact injuries – such as engineering, construction, and oil and gas - safety eyewear and in particular the lenses, should perform to the EN166 F standard as a minimum, ensuring the lens provides impact protection against a 6mm steel ball weighing 0.86g travelling at a maximum 45 metres per second at the time of impact. Find out more about lens markings. Further still, CR39 lenses are often only offered as the standard option by high street opticians. With Polycarbonate lenses having to be specified as an upgrade, if workers are unaware of the performance differences between the two they may opt for the standard option without being aware of the need for a higher performance safety solution for industrial environments. Short for 'Columbia Resin 39', which was the 39th formula of a thermosetting plastic developed by the Columbia Resins project in 1940, CR-39® lenses revolutionized the optical industry when they were first introduced. These lenses are half as heavy as glass, and far less likely to shatter. Like polycarbonate lenses, they too are made of polymers, which help the lenses stay sturdy but do not offer the level of impact resistance for industrial hazards that Polycarbonate lenses do. CR39® lenses are an ideal solution when the wearer is operating in a non-industrial environment such as offices and for Visual Display Users (VDU). But where impact risks exist they do not offer the level of impact resistance needed to reduce the threat of eye injuries. Originally designed to cover the cockpits of fighter planes before later being incorporated into the visors of astronauts and on the space shuttle windshields, polycarbonate lenses are up to 10 times more resistant to impacts than plastic or glass lenses and are also thinner and lighter. Polycarbonate lenses set the standard in eyewear safety and for those facing the risk of impact injuries from particles and flying objects – they really should be the lens type selected. To determine if your safety glasses are CR39 or Polycarbonate check the arm of the glasses and you will see a series of markings. If you see an F they are Polycarbonate, if you see an S they are likely to be CR39. 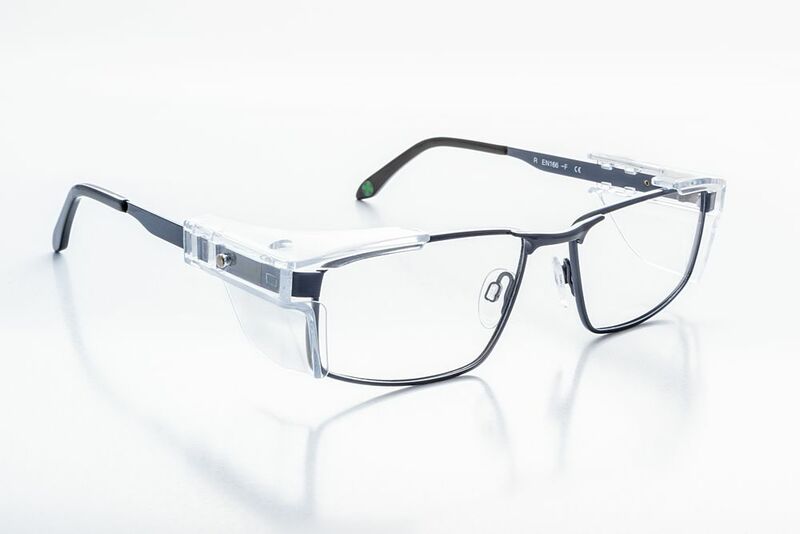 For hazardous industrial environments with a risk of impact injuries from particles it is important to opt for safety eyewear with Polycarbonate lenses. Polycarbonate is a soft material by its composition, being very flexible and therefore able to withstand impacts. But being softer and more flexible means it requires a scratch resistant coating to be applied to it, giving extra durability and preventing scratching to the lens. There are a number of coating solutions available on the market including TectonTM and TectonTM 400, which offer fog and scratch resistance. TectonTM 400 also offers protection against UV light and moisture repellency. One solution to ensure workers, including those with prescription safety eyewear requirements, get the ideal solutions for their needs is to bring in ‘on site’ eye test services for your workplace. Here at Riley, our “On+Sight’ service does just that. Combined with our Riley® RX prescription eyewear service it delivers a tailored solution for all workers safety eyewear needs. Consisting of a state of the art, fully equipped mobile optician vehicle, staffed by highly trained optometrists with an appointment given to each worker to have their eyes tested. Eye tests are carried out on every worker to determine their eye health, provide the right safety eyewear and to ensure that workers with prescription eyewear requirements are provided with leading safety solutions matched to their specific needs. The service offers a full range of prescription models and styles including single-vision, bifocal and varifocal options all expertly manufactured within our UK-based eye care laboratory. It also means we are able to offer workers a much wider choice of prescription safety frames – many more than a typical high street optician. Being able to test people in the workplace ensures very little disruption or inconvenience for the workforce whilst also minimising any downtime as Brian Barr, Safety Manager of renowned global hazardous and industrial area electrical lighting and control gear supplier, Hubbell Scotland attests in the Hubbell case study. For those working in industrial environments with a risk of eye injuries it is vitally important their prescription safety eyewear meets EN166 F and they understand the differences between Polycarbonate and CR39TM lenses that are often offered as a standard solution.